You might not give your sewer system much thought, but it is one of your home’s most vital systems. It is responsible for transporting waste and wastewater away from your property in a sanitary, safe manner, and in doing so, it helps protect your family against the diseases that were common before the invention of modern plumbing. Fairly simple in nature, they usually do their job just fine with minimal intervention. Once in a while, though, trouble arises. When you are having problems with your sewer system – no matter how insignificant they may seem – it’s important to seek help from a professional plumber in Crowley TX right away. At Lightfoot Mechanical, we are here to help with sewer repair in Crowley, TX and the surrounding neighborhoods. 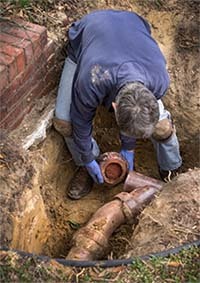 Whether you have a clog, a damaged main sewer line, or any other type of sewer problem, you need to have it fixed right away. At Lightfoot Mechanical, we can help. We offer expert sewer repair in Crowley, TX, and you can always count on our team to get the job done right. Dealing with raw sewage is extremely dangerous, so sewer repair is not a job you should try to tackle yourself. When you need a hand with sewer repair in Crowley, TX, contact the experts right here at Lightfoot Mechanical.